A patented process takes ordinary hair color and makes it extraordinary, by adding self-illuminating glow! 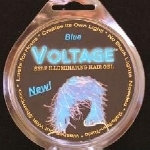 Voltage does not rely on UV, neon or black lights to create glow. So say the purveyors of Voltage Self-Illuminating Hair Gel. Posted by Alice Shirrell Kaswell on Friday, December 29th, 2006 at 12:01 am under Arts and Science.